The words Caravan Palace may be yet to come across your radar, and understandably so. ‘Electroswing’ may also be missing from your lexicon as well, but the two are to each other as ‘Chris Brown’ is to ‘dickhead’. On that gratifying thought, we should explain that Caravan Palace are in fact an underground French outfit who have been making waves with their infectious retro dance music. Mixing 1920’s dance hall feels with electronic beats and synths, Caravan Palace sound like Josephine Baker let loose on a mixing desk. 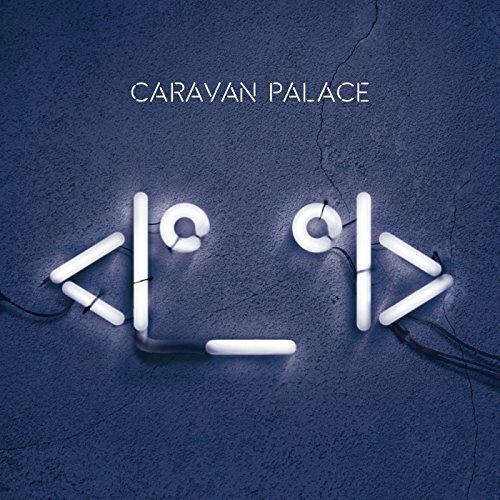 Gaining recognition for their irrepressible live performances and irresistible retro edge, Caravan Palace have now released their third studio album, titled <|°_°|> or Robot. Moving even further into electronica with this record, the band bring elements of hip-hop and even dub step to the tracks. Opening with the heel kicking Lone Digger, the jazz inspired intro launches into a pop infused refrain and sees vocalist Zoé Colotis pushing a nice bit of attitude. Followed by the laid back of Comics, the down tempo beat and sliding synths really nod to dub step tunes. Sample-like vocals and breakdowns followed by a very definite drop feel more contemporary than previous that Caravan Palace releases. The album doesn’t slip completely into this slower style, acting more like a judicious punctuation to the more frenetic numbers.